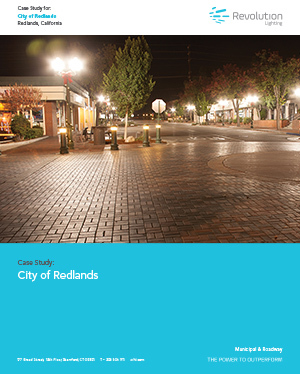 Redlands - Revolution Lighting Technologies, Inc.
Redlands, California retrofits its decorative street lights with LED to improve efficiency and preserve the historic ambiance of its unique downtown. The payback period for the retrofit investment was only 4.5 years. Partnering to engineer custom LED lighting solutions to preserve historic fixtures.